I have been having so much fun making travel pillowcases. All you really need is 14″ of fabric plus a band. It is pretty cool how the construction of this pillowcase is done. sausage technique is absolutely amazing. 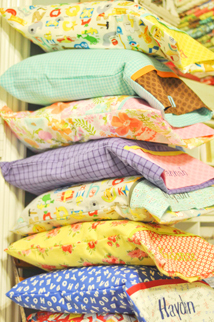 The travel pillowcases are made completely different using 1 width of fabric. These are fun to keep in the car for road trips or the occasional road side pillow fights! How about using them as pillowcases/gift bags! the trim and band. Pin in place. 4. Sew along the 14″ side keeping all the layers together . 6. 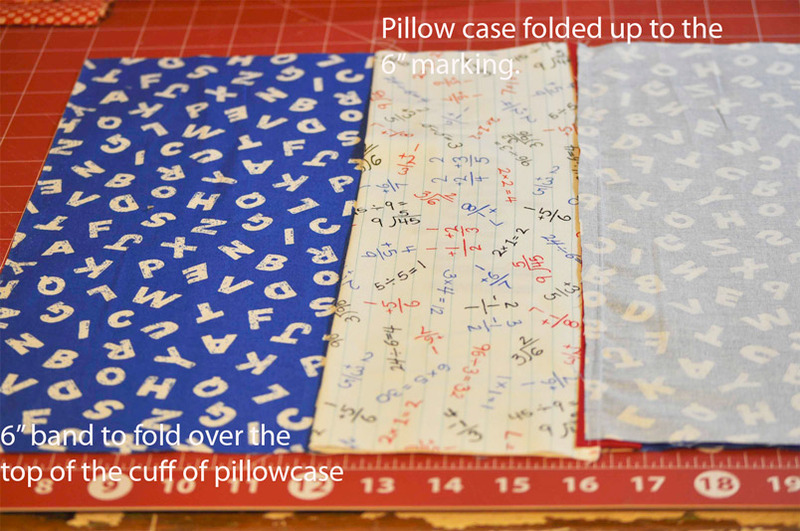 On the opposite end of the pillow case, fold under 6″. Press. Fold under 1/4″ of the 6″ and press to create a hem. 7. Fold body right sides together. 8. Fold the flap over the top of the band creating an envelope and pin in place. 9. Sew the 2 side seams. 10. Trim corners to eliminate any bulk. place and cover the top 6″ of the side seams. 12. Press and add a 12″ x 18″ travel pillow. your travel pillow is before cutting and vary the pattern slightly. 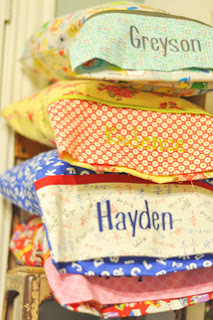 For some of the pillowcases I used flannels. Excellent idea, great tute!! Thanks. I just found your blog today. Fun! I'm looking forward to the new honeycombs. I love your new hexi-quilt.